Today we’ll be taking a look at the HyperX Savage EXO, which is one of the newest USB 3.1 Gen 2 portable SSDs on the market. Inside, HyperX went with a SATA III drive powered by the Marvell 88SS1074 controller paired with 64-layer 3D TLC NAND Flash. This combination allows the HyperX Savage EXO series to reach sequential speeds of up to 500 MB/s read and 480 MB/s write. 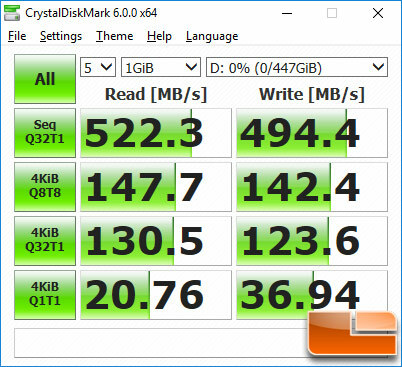 These are respectable speeds for a portable SSD with a SATA drive, but it won’t be competing with the faster drives on the market with PCIe NVMe drives inside. The HyperX Savage EXO series is aimed at gamers that are looking for a fast external storage drive that is compatible with their gaming PC as well as gaming consoles like the Xbox One and PlayStation 4. Kingston claims that the HyperX Savage EXO will load console games up to 20% faster according to their own internal test results. The HyperX Savage EXO is available in a 480GB capacity for $127.99 and a larger 960GB version for $292.62. Both of these external SSDs are backed by a 3-year warranty that also comes with free technical support during that time period. HyperX is not placing any endurance restrictions on the Savage EXO series, so no need to worry about how many drive writes were done should you need to ever make a warranty claim. HyperX sent over the Savage EXO 480GB model that is available under part number SHSX100/480G for us to try out. Inside the retail box you’ll find that the Savage EXO comes with USB Type C to A and USB Type C to C cables that are 1-foot in length. 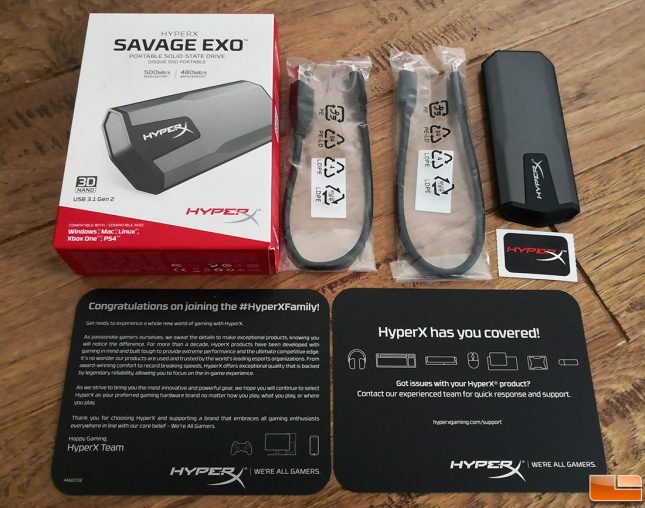 You also get a HyperX sticker, a welcome letter to the HyperX family and a card that tells you how to get in touch with HyperX if you have any issues with the product. The enclosure on the EXO was not designed to be user accessible and there is just a USB Type-C connector on the end of the drive along with a power/activity LED light. You can split the case open if you needed to as it is just held together by 8 plastic clips, but you risk breaking a clip and having it not going back together properly. If you plan on switching out the internal M.2 SATA drive you also risk the ASM235CM USB 3.1 to SATA not playing nice with the new drive you are putting inside. Cracking the drive open and replacing the drive is something we would only do if something goes wrong outside the 3-year warranty period. To benchmark the HyperX Savage EXO drive we’ll be using CrystalDiskMark, ATTO Disk Benchmark, Anvil’s Storage Utilities and a manual file transfer test. 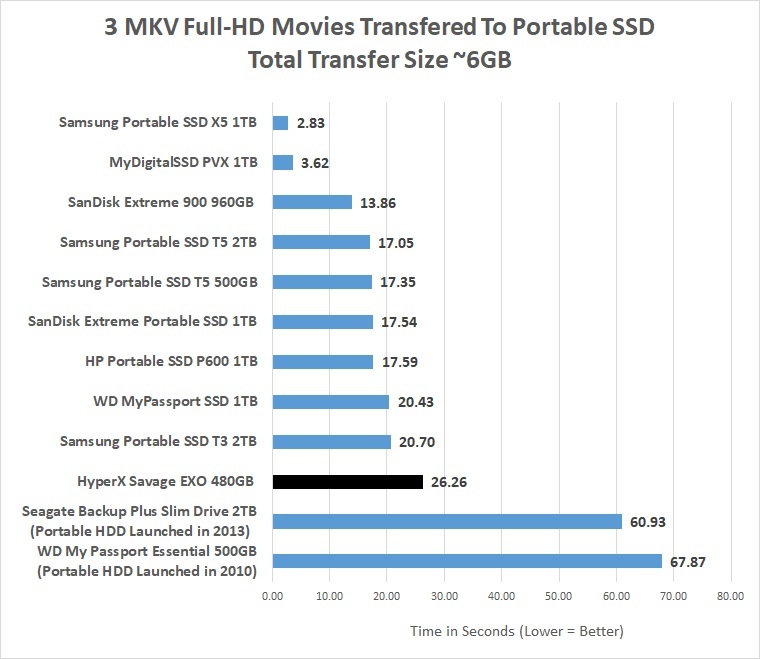 This should give us a quick overview of the performance of this portable drive performs. We will be using our Dell XPS 13 9360 laptop that is powered by an Intel Core i7-7500U processor to see how it performs. 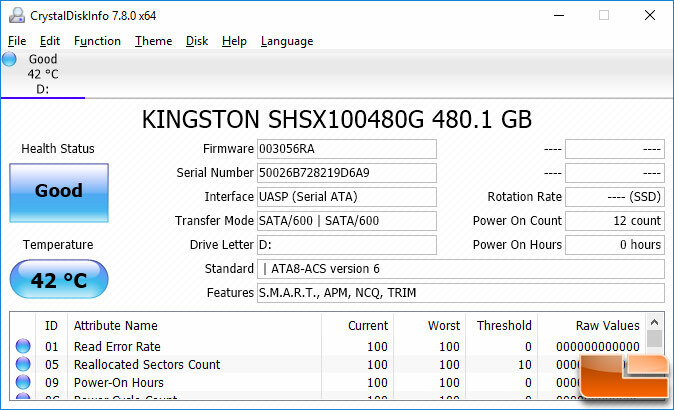 CrystalDiskInfo 7.8.0 shows that our test system was running the USB Attached SCSI Protocol (UASP) protocol and that the Savage EXO supports S.M.A.R.T., APM, NCQ and the TRIM command. 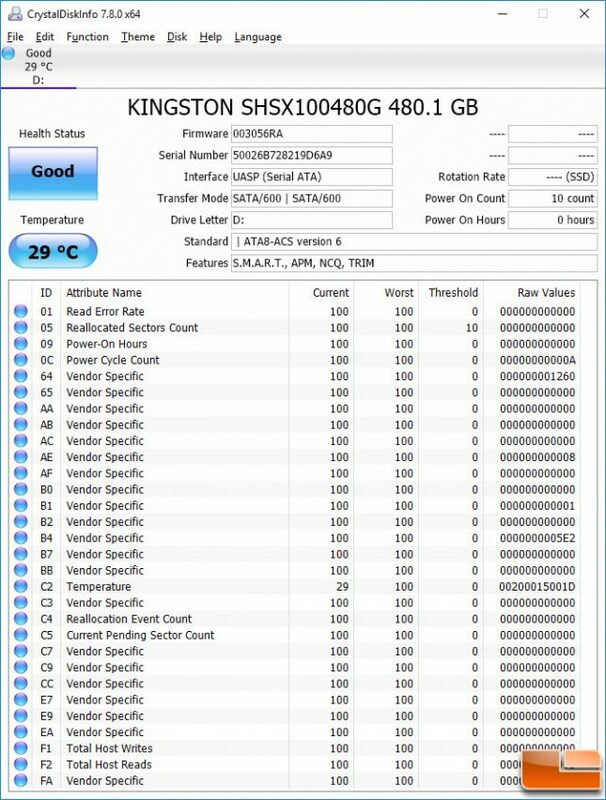 We found that the EXO 480GB drive would run around 28-29C at idle and then after about 30 minutes of use with active file transfers happening we noticed the temperature got up around 42C. The drive feels warm to the touch at 42C (108F), but it is still cool enough to handle. If you fill the entire drive the temperature will hit 50C, but not too many will write over 400GB of data at one time. 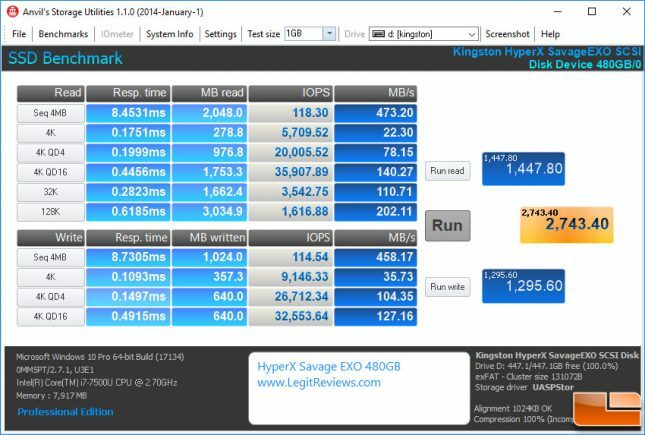 When it comes to sequential read/write performance we topped out at 522.3 MB/s read and 494.4MB/s write on the 480GB Savage EXO model that we tested. Not bad and this is over the EXO’s rated sequential speeds of 500 MB/s read and 480 MB/s write. ATTO Disk Benchmark showed that we were getting up to 520.09 MB/s read and 495.88 MB/s write speeds on the HyperX Savage EXO 480B drive through the Thunderbolt 3 port Dell XPS 13 laptop. Anvil’s Storage Utilities benchmark finished with an overall score of 2,743.40 points on the HyperX Savage EXO 480GB portable SSD. We wanted to do some real world file transfers, so we copied over few MKV Full-HD movie that added up to almost 6GB. Moving around movies is something almost everyone does on a regular basis, so we really enjoy the results from this benchmark. It took 26.26 seconds to transfer the three movies over from our PCIe NVMe SSD to the HyperX Savage EXO 480GB drive. We averaged 229 MB/s on this test with the HyperX Savage EXO 480GB drive and that this is the slowest of any portable SSD that we have tested. This is the 10th portable SSD that we have tested and it is slower by a good deal. The good news is that it is still much faster than portable hard drives and that might be why HyperX is marketing this heavily towards console gamers. The HyperX Savage EXO is certainly one of the best looking portable SSDs on the market today. With bold angular lines, the gray and black enclosure is certainly appealing. When you look beyond the beauty of the drive and look at performance you start to see the bigger picture with this drive. 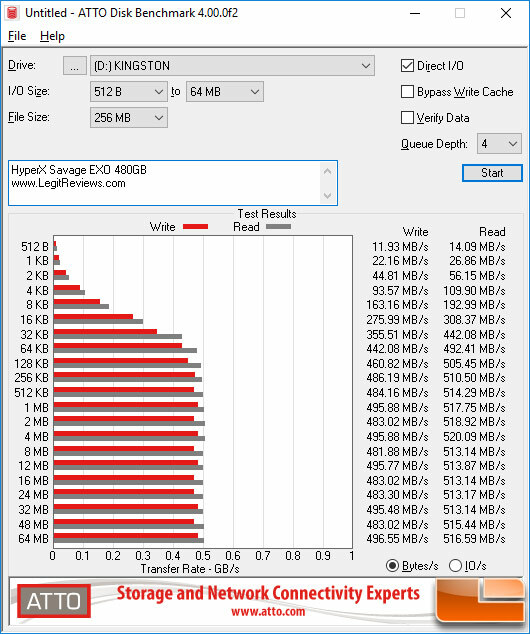 The performance of the HyperX Savage EXO looks really good in the canned benchmarks where the tests are short and sweet. In fact, the Savage EXO managed to exceed its rated speeds of 500 MB/s read and 480 MB/s write in those benchmarks. It was only when we transferred some large files that we discovered that this TLC NAND Flash drive has a very small amount of the NAND reserved as SLC write cache. On this 480GB drive the SLC Cache looked to be about 3GB, so if you write more than 3GB of data to the drive without any breaks the performance will drop. So, before the SLC write cache fills up you can write at 500 MB/s, but after that fills up the write speeds will be below 200 MB/s. The good news is that once the data is written to the drive you’ll be able to read large files just fine. So, the performance of the drive is okay for those that work with smaller files and is not ideal for those that often write more than 3GB of data at a time. When it comes to pricing the HyperX Savage EXO 480 is $127.99 shipped and that puts the price per GB at around $0.27. That makes this one of the more expensive SSDs on the market today. The Samsung T5 Portable SSD 500GB has read/write speeds of up to 540MB/s, AES 256-bit hardware encryption and the same 3-year warranty for $109.99 shipped. So, the drive that was 34% faster in our 6GB file transfer test costs $18 less and has hardware encryption as an added benefit. 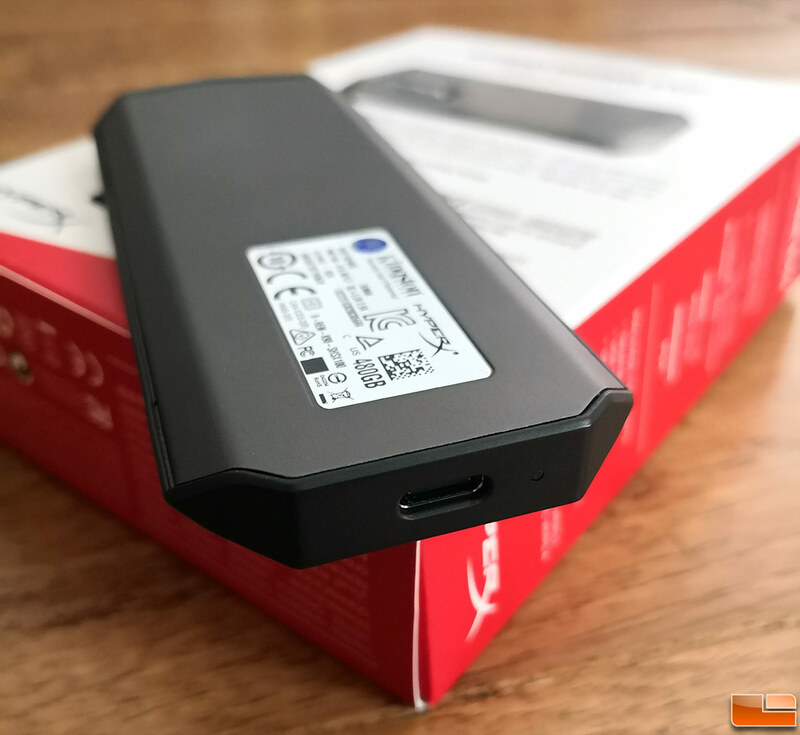 Then there is the SanDisk Extreme Portable SSD ($109.99 price) that happens to be IP55 rated (rugged, water- and dust-resistant) with pretty much the same performance as the Samsung T5 and also has a 3-year warranty. Recommending the HyperX Savage EXO 480GB drive right now is tough given its price and performance. The good news is that HyperX also started the MSRP off on the high side and then over time the pricing adjusts to where it should be in the market. We see this being a sub $109 drive, but that is going to be tough for HyperX to hit as there is essentially a Kingston UV500 480GB drive inside this enclosure. The Kingston UV500 480GB M.2 2280 SATA SSD currently runs $102.49 on Amazon and $99.99 on Newegg, so it will be tough to see the HyperX Savage EXO 480GB drive go below that. It would be awesome to see the HyperX Savage EXO 480GB at the $99 price point. but that isn’t going to happen very soon. 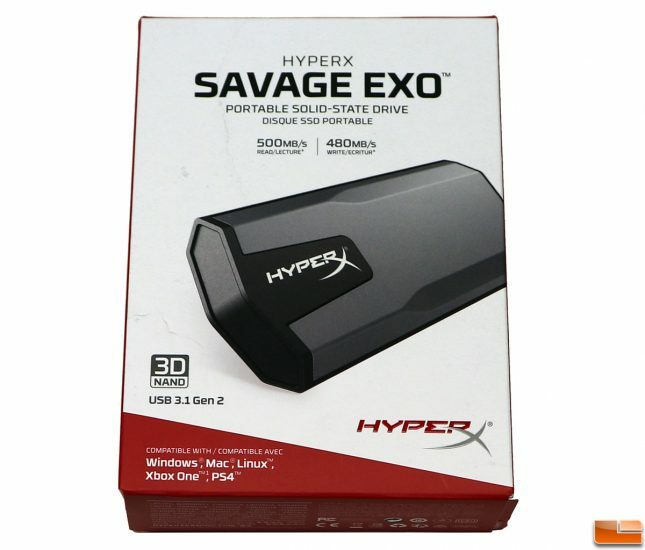 Legit Bottom Line: Savage EXO by HyperX looks great, but the performance and price tag make it a hard sell on a market that has a wide selection of portable SSDs available.